After talking to some holidaymakers that were staying in our neighbourhood, they suggested us going to street market ( tr. pazar). And when we arrived, it was clear that all the town gathered in there. Some of them were shopping, some of them were enjoying some Turkish fast food or just drinking tea in some local cafes. 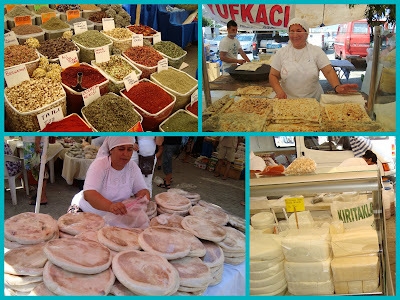 In above collage you can see a variety of spices, a woman selling gözleme ( Turkish yufka/fresh phylo with various fillings), another woman selling home-baked Turkish bread and a cheese stall. Though prices were higher compared to Istambul street markets but we couldn't resist fresh smelling bread, olives stuffed with garlic ( the best olives I've ever tried!) and a variety of fresh fruit. 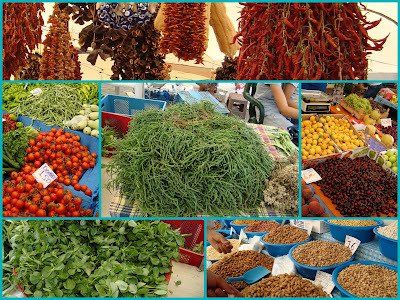 Though if you ever go there, have in mind that it isn't a typical Turkish street market as it was kind of adopted to tourists taste as there are many foreigners living in summerhouses around Yalıkavak. Still, it's full of fresh ingredients that Turkey can really be proud of!! !